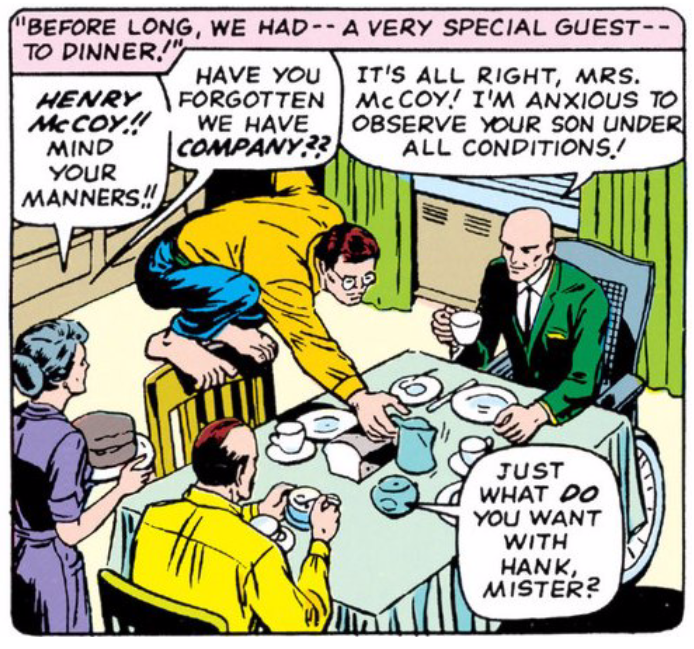 The X-Men #15, December 1965 | We've Got Some Issues. Man creates monster. Monster kills man. How old is the Golem story? How far back does the Promethean fear reach? Am I a Cylon? If you’re a vein of science fiction storytelling and you don’t ever point to the idea that man’s creation will one day replicate, surpass and enslave man then you might be doing it wrong. Here, with the Sentinels, Stan Lee is dutifully checking the Fear the AI/Terminator/Thinking Machines Box. 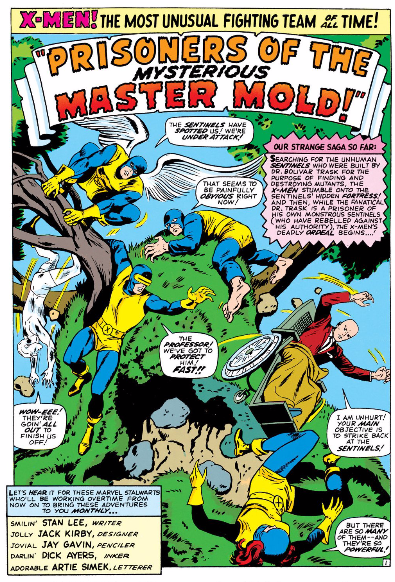 When last we saw the Sentinels, they had kidnapped their creator Bolivar Trask and taken him back to something called “Master Mold”. The X-Men followed “mental emanations” to a spot of empty and pastoral beauty in, presumably, the New York state countryside, where they hope to rescue Trask and defeat the machines. With typical 60s Marvel jubilance, the landscape itself opened up to reveal a starship Enterprise-looking hideout. Lasers were fired, X-Men flung. Now, as our mutants tumble and fly, we see enacted the mad comedy that typifies these books. 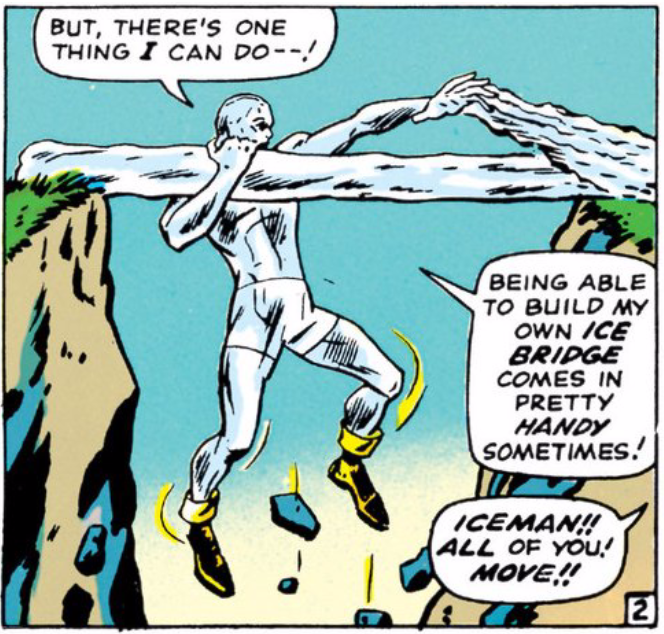 After the X-Men all save themselves by levitating, flying, or climbing ice ladders, they escape the base’s range “nature activator rays” and regroup to plan their next step. 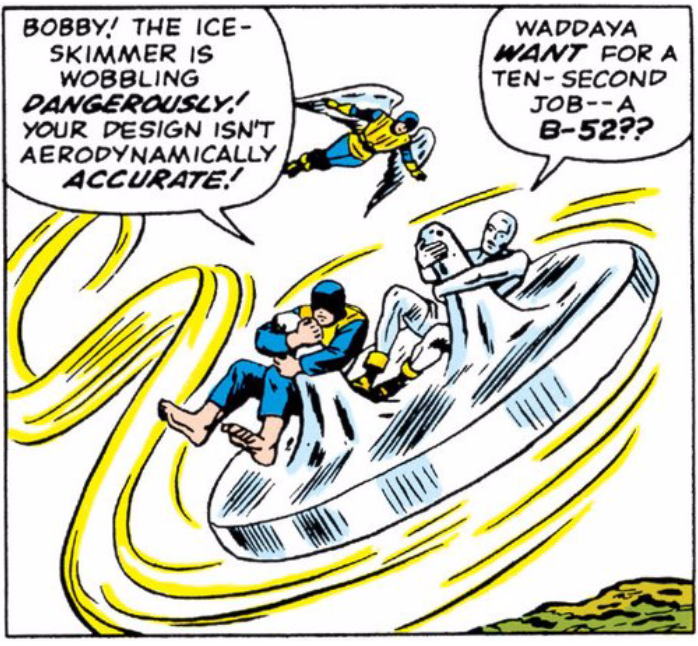 Determined to “invade” the base and learn just what Master Mold is, the X-Men devise—in typical X-Men style—the least likely method imaginable: Iceman whips up what this writer can only describe as an frozen merry-go-round on which they careen through the air. Angel flaps off to try and rescue them, but is diverted by a “gusher” of flaming fire. Beast and Iceman are trapped within the citadel (“Deposit them in the transparent cage! Good! Good!”) and for the millionth time, the X-Men regroup to “brainstorm” their next step. So now we know what Master Mold is. Sort of. Here’s how you create a race of Sentinels, I guess. Step 1. Create Master Mold. Turns out Master Mold is pretty ingenious. This maximally efficient, set-it-and-forget-it, Sentinel cooker makes Bolivar Trask the Henry Ford or Ray Kroc of violent, artificially intelligent, super machines. There’s always a moment in an X-Men book where things go delightfully off the rails. 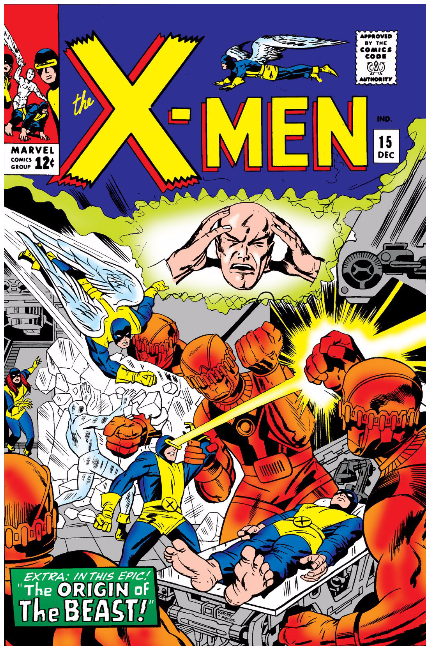 We get ours here when the lens returns to Xavier and his team; still at bay, now short two X-Men forward attackers. Their goal hasn’t changed but now they need a new tactic. So what now? Xavier is going to use his telepathic power to override the machines’ programming? I’m no telepath, but that seems not very likely. Also, why not give this job to Jean? 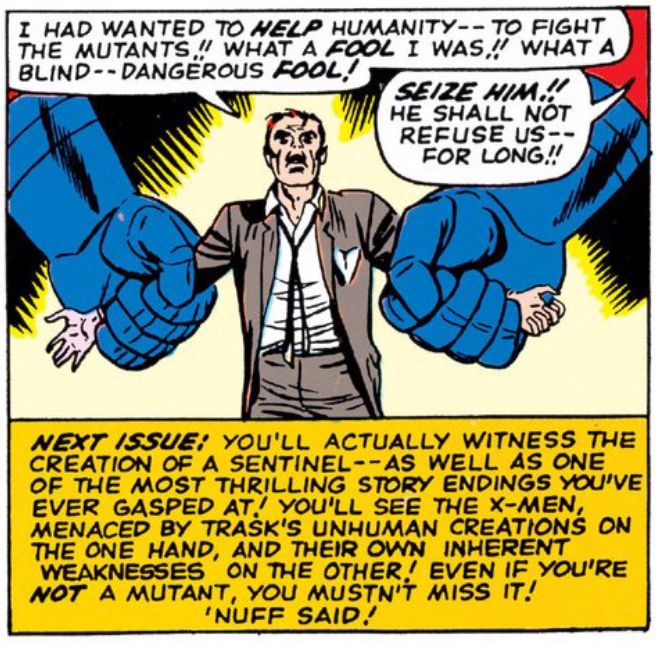 Jean could use her telekinetic power to, I dunno, blind all the Sentinels, flip their off switches, or maybe just separate their heads from their bodies, no? Interestingly, the “mental psycho-probe” is a lamp. Under the “irresistible influence” of the psycho-probe, Beast reveals not the secrets of the X-Men, but his own heretofore unknown origin story. Which is pretty pat. Hank’s mutant powers develop at pace with his adolescence, until—just like your high school experience—he’s outed as a mutant during a football game and chased off the field by an angry mob. Aware of Hank’s mutantness, Xavier makes a house call. 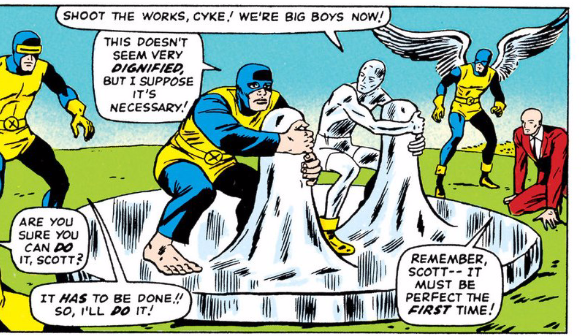 Back in the present day, Xavier senses that Hank is “telling too much” to Master Mold. 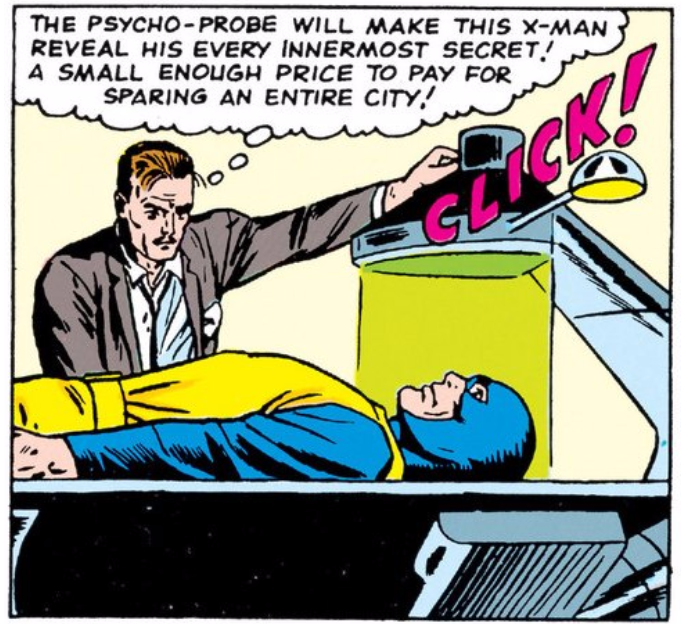 Xavier jumps into action by launching his own “astral image” to interrupt the interrogation. Xavier has performed this maneuver before when he sought Namor in Atlantis. It’s done a little less spectacularly here, but as always, it is cool to see Xavier on the field. Hold up. How could Trask create Sentinels? 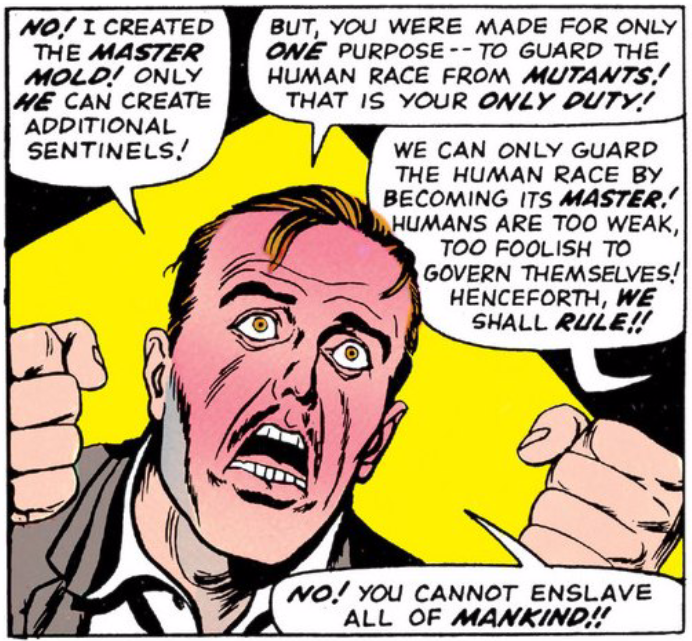 Didn’t Trask create Master Mold to create Sentinels? Weren’t they explicit about this, like, a couple of pages ago? We’ll have to get clarity on that one next time, as this issue ends on a hard cliff hanger. The introduction of the Sentinels is poised to reach across three issues. The action and art are, as usual, goofily brilliant and boisterous, but the writing here is lacking. We’ve advanced the epic of the Sentinels hardly at all. 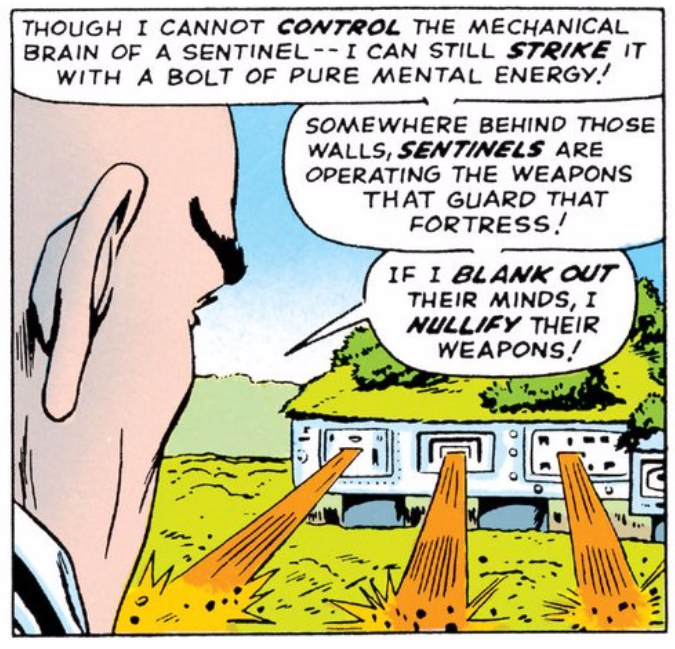 We did get to see Master Mold but we still don’t know what felled the Sentinel an issue ago (this writer guesses it was some new—or returning?—mutant skulking in the edges of the panels, waiting to be introduced). Beast’s “biography” is a couple of bland panels (we’ve already seen young mutants terrorized by muggles, already seen mutant powers in action on sports fields: Toad, Xavier himself). 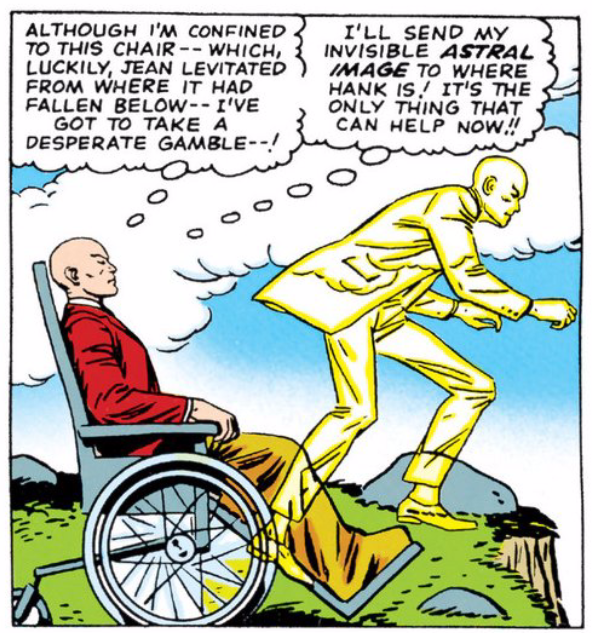 And what should be the high point, a psychedelic Xavier projection combating Master Mold, is crammed into a tight exchange too late in the issue. But there’s more to come, and the writers and artists of these books haven’t failed yet. Even if sometimes it feels like they’re only working with thought particles.